I will be honest, after 6 years of integrating a CGM into my T1 Diabetes routine, I expected the Freestyle Libre system to simply be a find/replace option. A few hours into the experiment, I realized how wrong my thought process was. Even though it is often lumped together with true CGM systems (Dexcom, Medtronic, etc), this system is NOT a CGM. The Abbott website calls it a "Flash Glucose Monitoring System" which is a much more accurate description. But I'm not even crazy about including the term "monitor" because that implies that the system actively does something. When I "monitor" the telemetry from the space station I don't just casually glance over the numbers and brush off a concerning trend. Nope - I dig into the signature, pull up historical data and if necessary, take action to fix the problem. I'm not asking for the system to make dosing decisions for me (although, that would be cool someday), but I am asking to be alerted when my blood sugar is out of range or heading there. How was the system packaged? The FreeStyle Libre system itself is intuitively packaged, and much to this Diabetic's surprise, the sensor box even included alcohol wipes to properly prepare the sensor site. In laziness, I often don't properly clean my CGM sites prior to sensor insertion (uh oh now you know all my secrets), but this small detail made it easy to use the system correctly. The instructions to combine the sensor with the applicator were very simple and only took me a few minutes to configure. I'm sure a seasoned FreeStyle user could complete the sequence very quickly. As with the Dexcom G6 system, there is a lot of medical waste associated with the FreeStyle Libre, although not as much as the G6 in my opinion. I hope that more Diabetes tech companies will start to reign in exorbitant waste when designing their systems. Which parts of the system did I like? While this review may seem harshly negative, there were a few parts of the FreeStyle Libre system that I really enjoyed. First - as mentioned previously, I appreciated with alcohol wipes being included in the sensor packaging, I thought that was a great touch. Additionally, the insertion was nearly painless and the FDA approved site location on the back of the arm is much more comfortable for me personally than the Dexcom's tummy-only approval. This site location was also a convenient (and not too personal) spot to swipe the receiver over even during work meetings or date night. I enjoy using my upper arms for my pump sites, so the FreeStyle Libre sensor felt very natural up there as well - since graduating college I'm no longer super self-conscious about non-Diabetics noticing my Diabetes tech sites and devices. I also can't leave this question without giving a huge kudos to the Abbott Global team for the sensor length - 14 days! Wow! This is a huge accomplishment. Which parts weren’t so great? One word: ALARMS, or lack thereof. For better or worse my approach to Diabetes management relies heavily on available technology. This approach is probably not for everyone, but as a busy mom of 2 who works 40+ hours a week (sometimes in the middle of the night), it gives me the best home/work/Diabetes balance. Instead of constantly checking my blood glucose graph I expect the system I wear to vibrate in my pocket when the trend is heading up or down - and as such, I have these limits normally set pretty tight at 140 mg/dL and 80 mg/dL. This scheme has lulled me into a hands-off monitoring approach, which does not work with the FreeStyle Libre system. The FreeStyle Libre system does not preemptively alarm or vibrate or suspend or anything. It is completely dependent on the user to swipe the receiver against the sensor before passing on its trends. To an outsider, this small difference in ideology may seem insignificant, but to the user, it means the difference between catching a low blood sugar at 70 mg/dL versus waiting to swipe until the shakes have set in at 55 mg/dL. How much do I trust the FreeStyle Libre system? The G6 updates (and stores) blood glucose readings every 5 minutes. The Abbott FreeStyle Libre takes new blood glucose readings every minute but only stores one reading every 15 minutes. The above graph is only 1 day worth of data, but the other 6 days were similar, I choose this particular day to show the performance of both systems during high and low blood sugar periods (it was honestly not my best Diabetes control day, don't judge!). It is clear that the FreeStyle Libre system consistently lags the G6 - sometimes at concerning levels. For instance, look at ~3am, the FreeStyle Libre shows a reading of just under 180 mg/dL whereas the G6 shows a quick downward trend just before 3am, with an instantaneous reading of nearly 70 mg/dL. If I had corrected at 3am based on the FreeStyle Libre reading, the low that hit around 5 am would have likely occurred sooner and more severe. Of course, it's difficult to back out the exact trend and readings that I would have acted on since the record only holds 1 reading for every 15 minutes, so it's likely the reading near 180 mg/dL was almost 15 minutes old. I don't understand exactly why Abbott designed the FreeStyle Libre system this way, in my opinion, it makes it difficult for endos to make accurate insulin adjustments - first, the readings are from the interstitial fluid which is delayed from blood glucose readings anyway, and second, the recorded readings could be 15 minutes stale. Obviously, this diabetic's trends can fluctuate greatly in 15 minutes (and I suspect I'm not the only one). If the reason is simply 'lack of data storage space' then decrease the amount of time between swipes, or allow the storage to be variable depending on the user's time between swipes. That way when I really want to get a good, solid trend report I can, and when it's not as critical I can simply see numbers over a longer period of time. Did the sensor irritate my skin? I have been lucky with my skin lately - it has been accepting adhesives well, and the FreeStyle Libre sensor was no different. The sensor patch itself was very small (about the smallest footprint it could be based on the size of the sensor, not a lot of excess adhesive). I did struggle to find enough sticky surface area to grab onto at the end of the 14 day period in order to remove the sensor, but I assume with a few more rounds I would figure out the trick for removal (it was still very "stuck on"!). The low profile of the sensor also ensured that the whole setup stayed well put the entire 2-week session! Who would benefit the most from a system like the FreeStyle Libre 14-day? It's safe to say once you go CGM it's hard to go back. This product is a great stepping stone from fingersticks to full-blown CGM, but it just doesn't allow the same hands-off approach that a CGM does. I could see it being a great option for someone whose life has a careful routine, and accompanying blood sugar control. Or someone who feels a great deal of anxiety when those pesky CGM alarms go off (ok, ok, that's me occasionally). But, in my opinion, "swiping" is a lot more work than simply clicking a button - we click our phone buttons all day long, swiping seems so foreign. 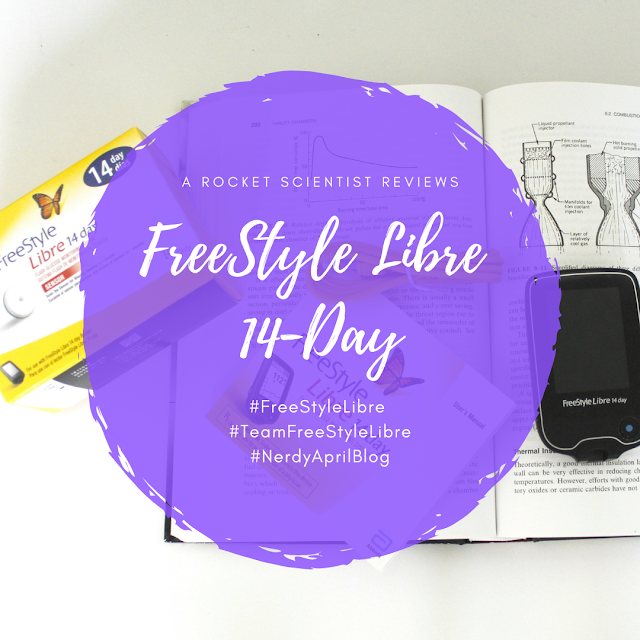 While my limited test run with the FreeStyle Libre system was just that - limited, it was long enough for me to decide that the system does not easily fit into my Diabetes management routine, style or goals. My schedule is constantly changing, sometimes my sleep pattern even flip flops when I have to work overnight in Mission Control - the effort my babies require is variable and lord knows my exercise schedule is less "routine" and more "fit-it-in-whenever-I-can". I need a system that allows me to focus on these aspects of life right now without constantly "swiping" to catch a trend before it's full-blown Diabetes crisis. As with any Diabetes related product - your Diabetes may vary, and my opinion should not deter you if this system aligns with your Diabetes management right now! If the Libre is that working for you except for the swipe, there are add on devices that sends the data to your phone and tracks it 100% of the time without a swipe. I think there are two such products and they are fairly inexpensive.